America has a problem, a big one, the middle class has been wiped out. It is economic genocide and the target is most of America. The statistics just continue to pour in on how poorly America is doing. Even as the great manufactured crisis is over in D.C., the political agenda once again has nothing to do with helping America's middle class. Why jobs are not job #1 by this government we do not know. To drive home just how bad it is below we show some damning maps. The Southern Education Foundation has a new report showing the percentage of low income students in public schools from 2011. 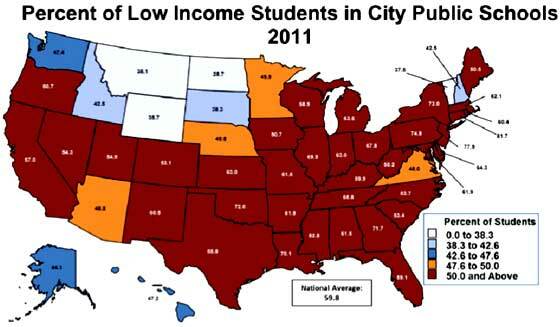 In 2010 and 2011 there was a new record set, the majority of kids in public schools in the West are poor. 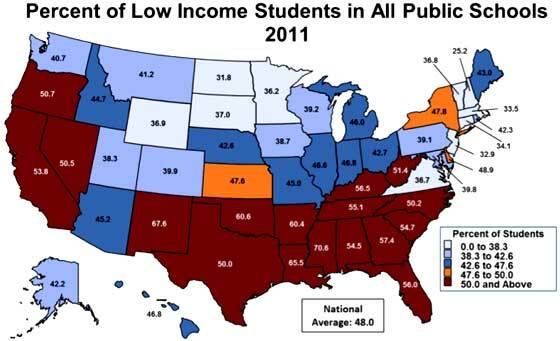 Below is their map showing in the South and West, the majority of students are low income. In other words, America is now raising a nation of poverty stricken kids. A majority of public school children in 17 states, one-third of the 50 states across the nation, were low income students – eligible for free or reduced lunches – in the school year that ended in 2011. Thirteen of the 17 states were in the South, and the remaining four were in the West. Since 2005, half or more of the South’s children in public schools have been from low income households. Low income is defined as below 130% of the poverty line and these kids qualify for a free lunch. Poverty also significantly impacts reading test scores, school opportunities and the ability to go to college. When one just looks at cities, the situation is much worse. Kids in public schools who are low income account for 59.8% on average of all students in K-12 public schools. Any urban area with a population greater than 100,000 is teeming with America's poor. Mississippi had the highest rate of low income students, 83%, In New Jersey cities 78% of the students are poor and Louisiana, Illinois and Oklahoma all low income rates of greater than 70% for their K-12 students. In 2012 there were 48 million people without health insurance in the United States. 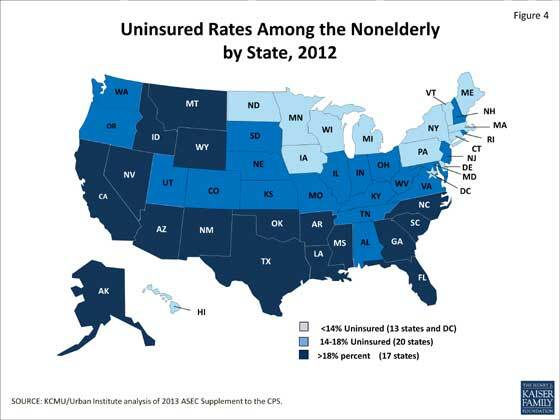 This is 15.4% of the population under the age of 65 on average with Texas hitting 24.6% uninsured. Considering Obamacare is off to a terrible start, this isn't good news. On the other hand, States with Republican governors refused Federal funds to expand their Medicaid coverage and as a result, 5.2 million will not be able to obtain health insurance coverage. Today 15% of Americans live in poverty. 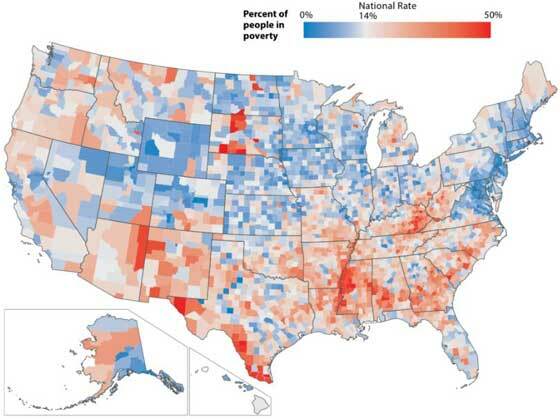 Below is a county map showing the previous year's poverty rate and we see once again the South has high concentrations. People are living on the edge. People living in liquid asset poverty is a whopping 43.9%. This means 132.1 million people lack the savings to cover basic expenses for three months if they lose their job, have a medical emergency or some other sort of crisis. 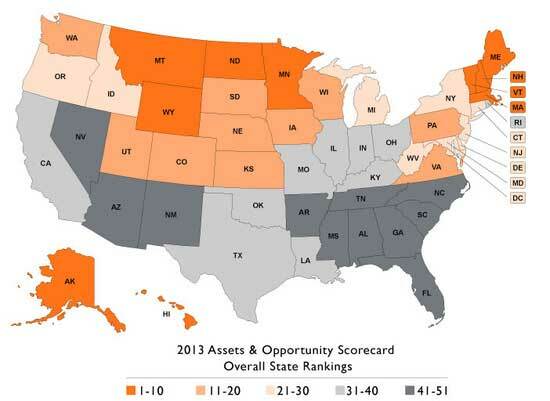 The below map breaks down that percentage state by state. Pretty much half the country is living on the edge, paycheck to paycheck. 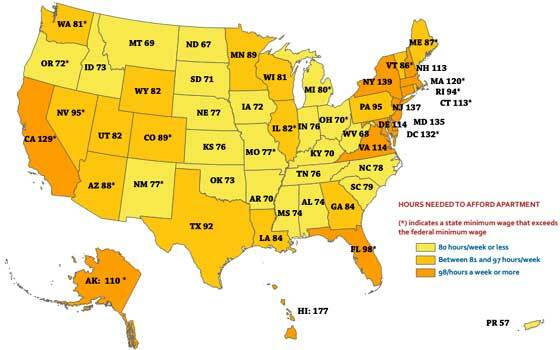 This map shows how many hours one has to work at a state's minimum wage to afford to rent a two bedroom apartment. That's right, many jobs people are working today cannot even pay for shelter. Alternatively, the wage one needs to make rent on a 2 bedroom where one is paying 30% of their income on rent when working full time. Finally, the next map shows how income inequality has grown in United States over time. The gini index is a measure of income inequality, the higher then index gets, the worse income inequality is. 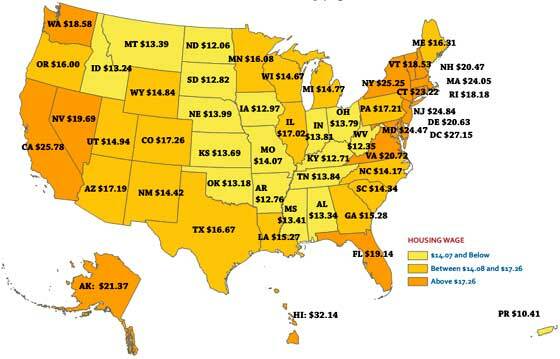 If there is ever a map which shows the the destruction of the U.S. middle class, it is this one. America is clearly in dire straights and the above maps it all out. Why then has this government, this Congress not put wages and jobs as jobs #1 is a good question. Why America hasn't outright revolted, demanding this government do so is a better one. Firstly, that gini coefficient map is just incredible. My belief about jobs, as a non-economist, is that both parties have been hijacked by corporate plutocratic interests. At the end of the 1980's, after getting shellacked in 3 straight elections (reagan and bush I), the Democrats decided to become the 2nd party of wall street in order to win elections. Seemed to work for Bill Clinton who adopted many of Reagan's pro plutocratic policies. The old new dealers and unions were no longer enough for the Dem's to win elections. I had hope for Obama to be an agent of change and to give voice to the working class of America, which should now include white collar workers. Where is the Employee free choice Act you may ask yourself? Now the republicans find themselves in a somewhat similar situation as the Dems of the late '80's. Their traditional base of reagan democrats are dying off. The difference is i don't see the republicans picking up the mantle of the poor in order to become electable again. If anything they will traverse farther to the right (if that's possible) probably again dragging the democrats with them. The democratic party in europe would be a center right party in almost every country. The only solution is one from below that does not initially involve either of the 2 political parties. And unfortunately, i just don't think it's bad enough yet. Another mind blowing proposition. People will have to be starving and homeless in huge numbers before any real populist ground swell gains traction. There's just enough left of FDR's new deal, think food stamps and unemployment insurance to protect against absolute destitution at this point. Though that may rapidly change if the republicans gain control over more of the government. Then they can truly return the entire US population to the 1800's which is their stated goal. Will there be enough Americans alive at that point who will remember what a true middle class country was like to even fight back? It doesn't matter neither party will put the middle class first. If it is the GOP, they want to deny people their benefits, taken out of their paychecks, that's Medicare and social security, along with gutting food stamps. If it is Democrats, they want to flood the U.S. with foreign workers, enable even more offshore outsourcing through bad trade deals, and of course put in their pet projects and make things as inefficient as possible due to lobbyists, special interests. The problem is that almost none of the American population knows anything about basic economics. As a result, they support legislation that is and vote for politicians who are harmful to economic growth and well being. People spend vast amounts of their time on crap, but if -- out of all the hours available in their entire life spans -- they would once spend only a handful of hours reading Economics in One Lesson, by Hazlitt, or Basic Economics, by Sowell, our nation would be far better off. Politicians do what gets them elected. It is ultimately the responsibility of the people for their own fate.